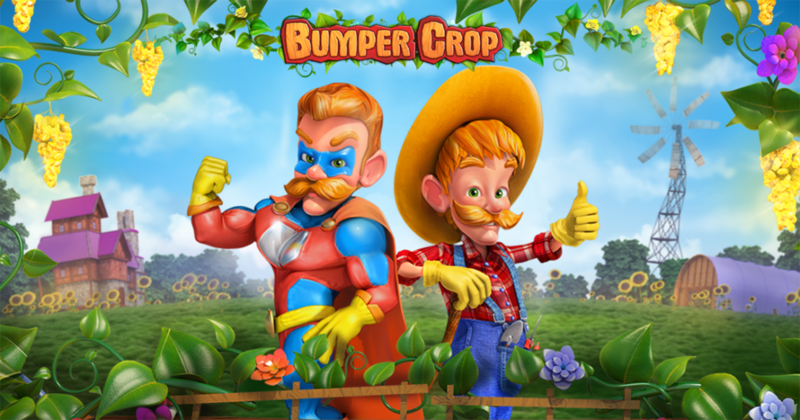 The hero of Bumper Crop is a character called Super Gardener. He can make plants grow quickly, raising entire crops in a matter of seconds. The game is just as much about gardening and about crops as it is about this super hero. The slot’s 27 lines provide you with prizes that go up to $13,500. The gardening theme is easily visible in the game, its reels being occupied by gardening images or by poker cards made out of wood. There is the Gardener character in the base game, which will transform into the Super Gardener once the free spins are activated. The action takes place right next to the field of cultivated plants, with the gardener leaning against one of his gardening tools, with the reels on the right side of the screen. One thing unusual about it would be the number of available paylines, which is fixed at 27. You can only modify the bet per line, which varies between $0.01 and $5. You end up with bets of up to $135 per spin. About half of the symbols used in the game are the kind that offers prizes without being on the same payline. There are five regular symbols (the poker cards), five scatter symbols (the gardening related images) and the wild symbol. The game’s wild feature isn’t just going to pop up on the reels. You need the right symbols to appear on the right reels, and during the right spins. With each symbol of the right type that you collect, the tree sapling grows and eventually becomes a fully matured plant, triggering the free spins at that point. Free spins come with Super Gardener icons instead of regular Gardener scatters, which increases the growth speed of the trees for the duration of this feature. Try of out a demo version of Bumper Crop.